Its the year 2000 and Childress hits the road from Megiddo, the legendary fortress in northern Israel where Armageddon is prophesied to start. Hitchhiking around the world, Childress takes us from one adventure to another, to ancient cities in the deserts and the legends of worlds before our own. Childress muses on the rising and falling of civilizations and the forces that have shaped mankind over the millennia, including wars, invasions and cataclysms. He discusses the ancient wars of the past, including evidence for ancient atomic wars, and relates the dim past with the present and dim future. Among the various topics in the book: *The amazing sciences of ancient India and China *David's involvement with the strange megaliths of New Zealand *Intelligence operatives in New Zealand and the attempt on David’s life *David's travels to remote islands and the controversy that it has created *How David and conspiracy pal Kenn Thomas were dragged into the Kennedy Assassination by one of the “conspirators.” *Kenn Thomas, David, and some of their associates are apparently the real-life model for the “Lone Gunmen” of the X-Files television show. Special autographed edition. 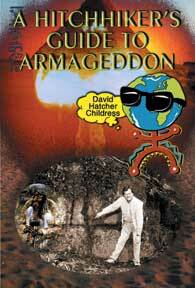 A HITCHHIKER'S GUIDE TO ARMAGEDDON AUTOGRAPHED By David Hatcher Childress. 370 pages, 6x9 Paperback. bibliography. Illustrated. Special autographed edition.